Markets in Asia were looking like they have been on borrowed time a few days this week and so a small retracement ahead of todays US numbers is no real surprise. Most indices were lower but saw a deserved bounce in the KOPSI after yesterdays drumming and also a small gain for the Hang Seng with real estate stocks leading some of the gains. The Nikkei lost -0.4% with industrials and food suppliers losing more ground than the auto manufactures to gain. The yen had a quiet night and still plays with a low 110 handle just ahead of the US data release. Volumes were low, even for the summer, but we still have many players on the side-lines. European morning sessions is watching a better market for all core indices with gains of around +0.2% for FTSE, DAX, CAC and IBEX. The morning talk is all around anticipation of US numbers but we did see strong earnings release from RBS (a profit declared for the first time in three years). Also, it announced plans to shows it European base is to be Amsterdam. Upon the last price seen the shares were up a little over 2% in the day. Deutsche Bank also said it will relocate half of its London trading positions between Frankfurt and Berlin. The release came in better than expected with a headline number of +209k. Hourly earnings released +0.01 better than previous at 2.5% and the stocks market liked what it saw. By the close of Europe the DAX, IBEX and CAC had pushed up over 1% with the FTSE closing around +0.5%. Initially, the DOW added around 80 points but we drifted back the balance of the session. The bond market sold off; VIX broke lower and is back with a 9 handle and we also saw a bounce in the DXY. Main talking point this afternoon was that this is the second month we have seen a +200k release and now asks questions of the Federal Reserve’s policy move. This news encouraged a steepening of the curve in anticipation. Another record for the DOW and looks as though the broader market has potential to make-up for lost ground against the DOW. 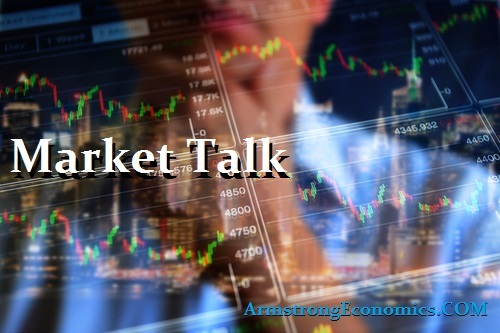 If this is the beginning of stronger economic data then the tension between the FED and ECB has potential to escalate and we may hear signs of that when we see the annual Jackson Hole symposium on August 24th. 2’s closed 1.35% (+1bp), 10’s 2.26% (+4bp), 30’s 2.84% (+5bp), Bunds 0.46% (+1bp) which closes the spread +180bp. France 0.74% (+3bp), Italy 2% (+3%), Greece 5.35% (-6bp), Turkey 10.39% (+3bp), Portugal 2.80% (+2bp) and UK Gilts 1.17% (+2bp).